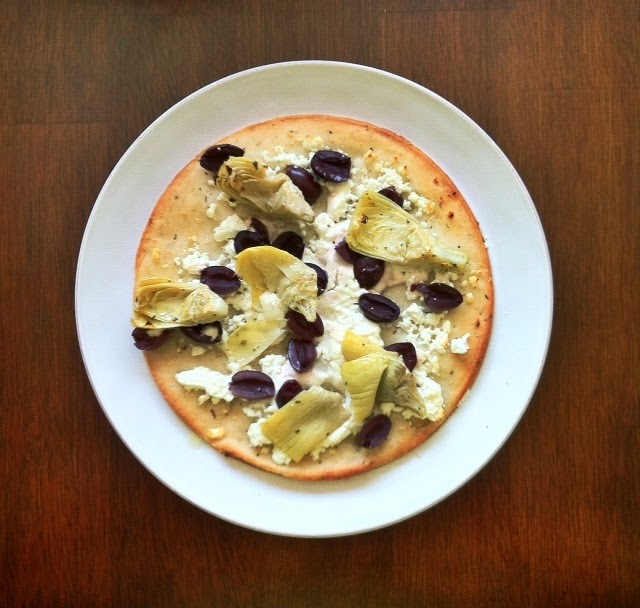 Did someone say artichoke hearts and black olives? Probably not. Most people I know hate both of these. If you're one of these people and you're willing to try something new, I'm telling you artichoke hearts, black olives, and goat cheese were made for each other. I can't take credit for this recipe. One of my roommates who I lived with prior to getting married came up with this divine pizza recipe, but knowing I was just as obsessed with olives (seriously, I could eat a jar) as she was, she made a point to tell me about it. She made it on regular crust, so I couldn't get a taste, but today I recreated it on a GF crust. All there is left to say is, yum.